I finally created a command center in our house, but it is very much a work-in-progress…and with a family of three (including one 18 month old), there isn’t much need for extreme organization beyond the basics. But I know that as our family grows, and kids get older, we’ll rely on our command center organization more and more! 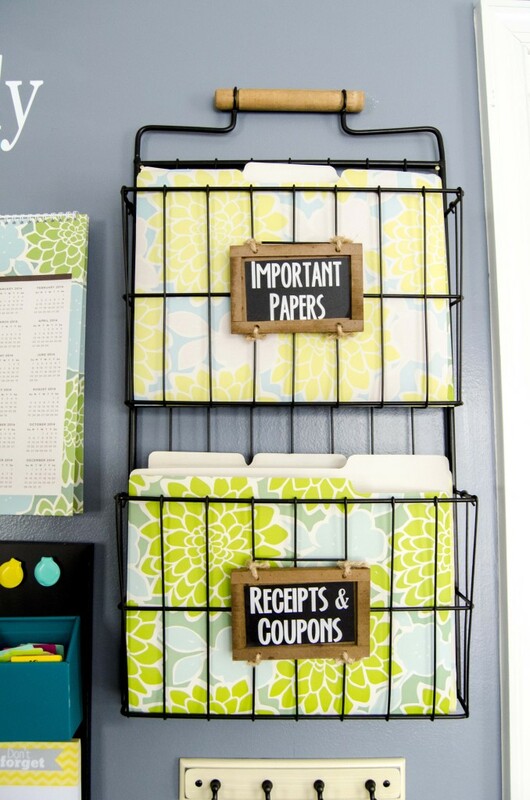 A great command center is a perfect mix of organization, function, and style. You’ve got to first determine what kind of organization your family needs before you actually go shopping for all the details. If you take a little bit of time to really plan out your space, you’ll end up with a beautifully functioning (and affordable) command center that will help make your life a little easier! 2. Take inventory of your clutter. 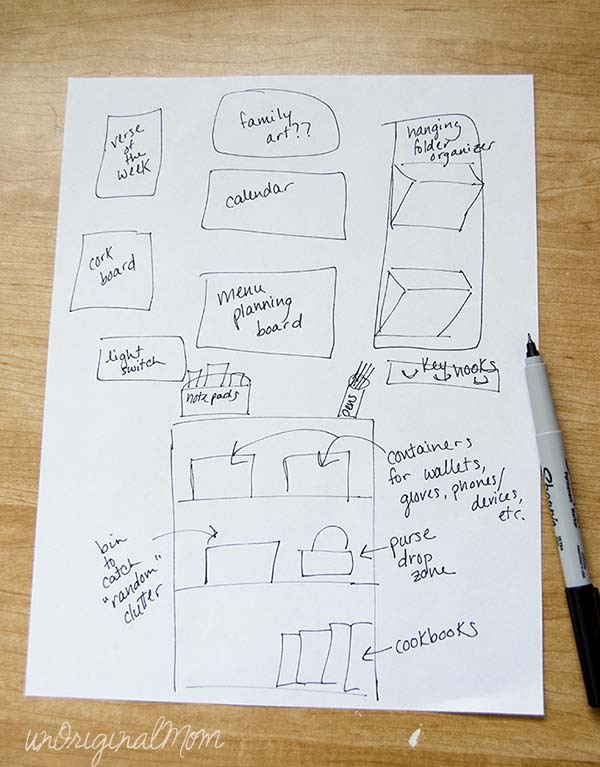 Here’s a great way to figure out the clutter that regularly accumulates in your space – without tidying up first – take a pad of paper and a pen and go write down everything you see lying around your space. 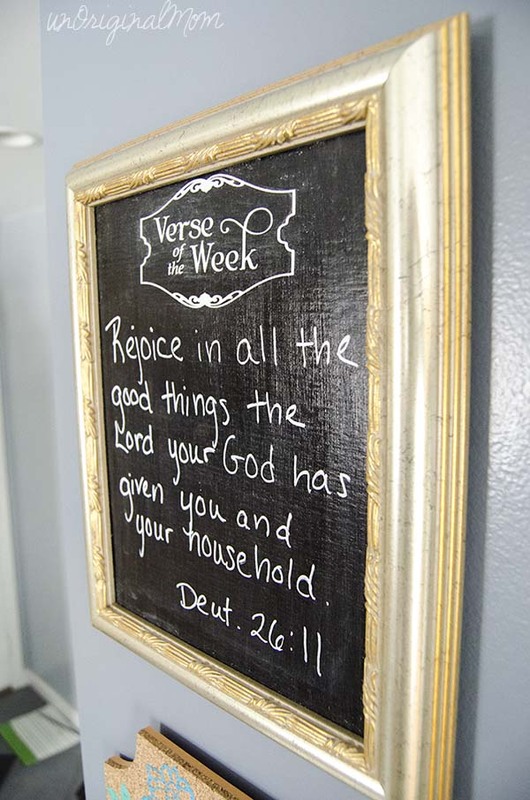 This is good to do mid-week, when the daily mess has really had a chance to accumulate. You’ll see things like keys, phones, wallets, mail, school papers, random papers, lists, coupons, and probably much more. Write it ALL down. You know what they say – “A place for everything, and everything in its place.” Decide where those places are! 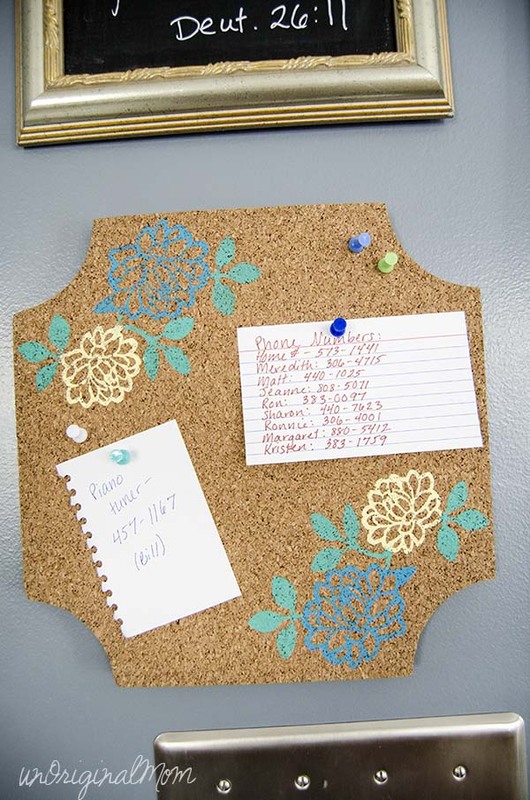 If you need a place for something that doesn’t already have a home, start a list for your Command Center. Include everything that needs to have a home in your new space. 6. Go shopping. It will be reeeeally easy to overspend, especially when you’re in the store and see something absolutely adorable that you didn’t know you needed. My advice – go to the ATM and get cash in the amount of your total budget. (If you’re ordering items online, be sure to account for that money out of your budget.) That way, you’ll be less likely to impulse-buy and more likely to stick to your list. 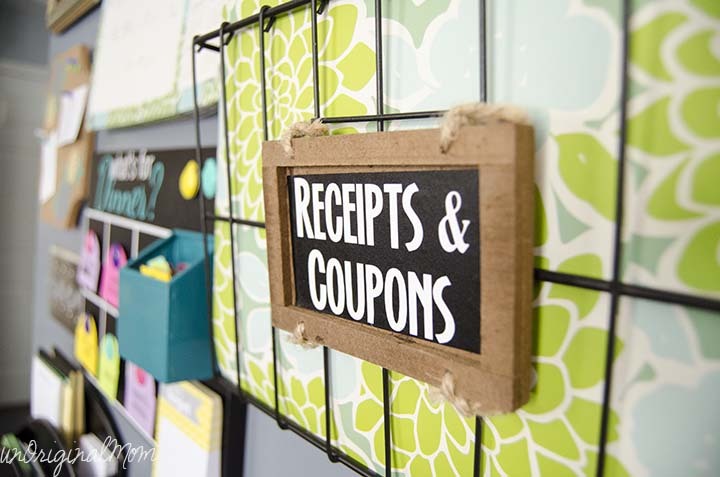 Some things that might be on your list: clipboards, frames, magnetic chalkboard/whiteboards, dry erase calendar, wall file organizer and file folders, hooks, cork boards, magnets, push pins, chalk or dry erase markers. 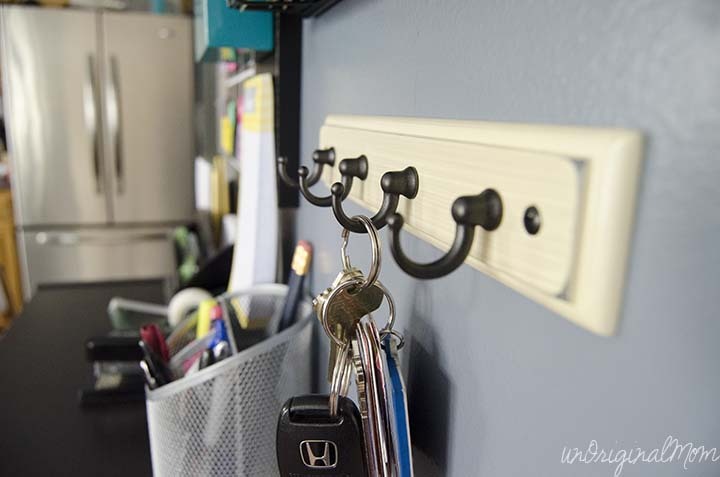 Check out my list of Command Center Must Haves for more specific ideas – as well as where you can buy the same wire wall organizer I have! 7. Make it pretty. If you’re like me, you’ll be much more likely to keep stuff organized if it looks pretty when it is put away. Pick a color scheme for your command center. Then, instead of buying plain manila folders, find some with a fun pattern. Don’t be afraid to use pops of brighter colors too! Make pretty labels using your printer, craft cutting machine, or pre-cut letter stickers from the scrapbook section of the craft store. 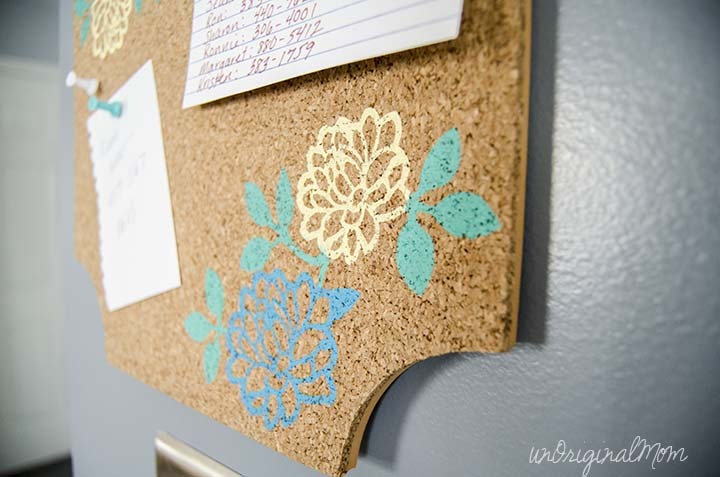 I took a plain cork board and painted some dahlias on it to make it pretty (using a contact paper stencil cut by my Silhouette!). 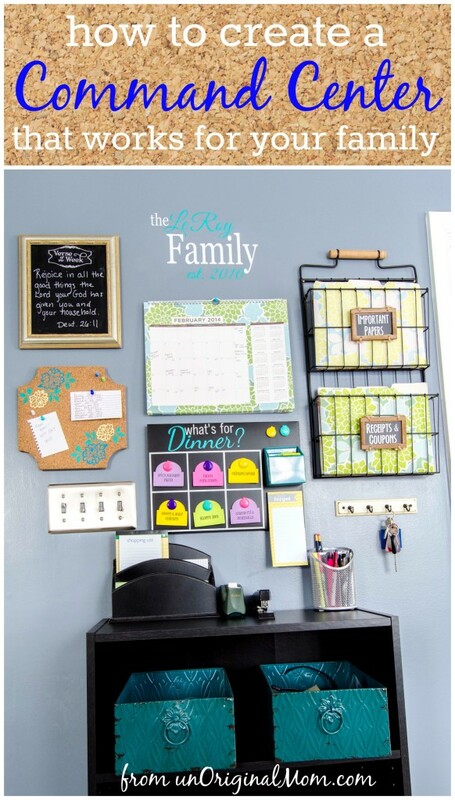 Create a family Command Center that makes you smile each time you walk past it. 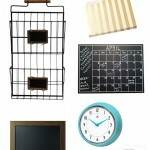 Are you ready to put together the perfect Command Center in your home? I have a guide that will help you! 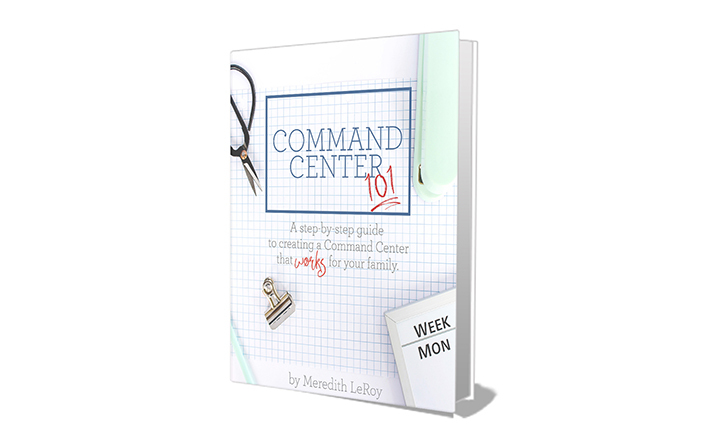 Introducing Command Center 101, the step-by-step guide to creating a Command Center that WORKS for your family! Click here to find out more. Looking for more command center ideas?? 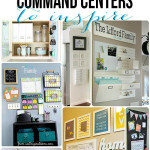 Here’s a great list of 20 command centers that are sure to inspire. 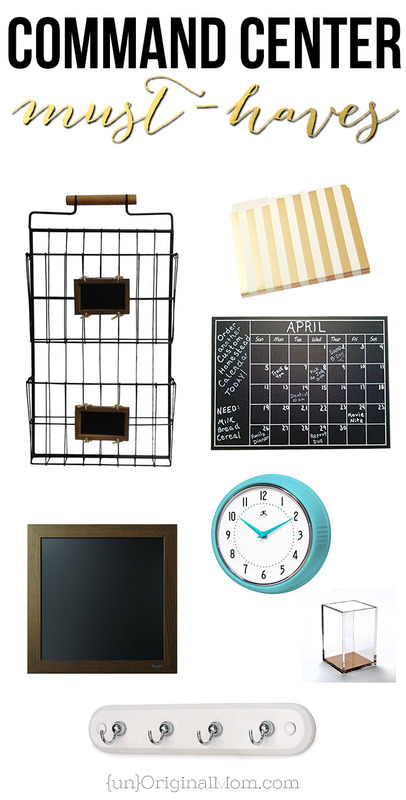 And you’ll definitely want to take a look at my list of Command Center Must-Haves! Psst! 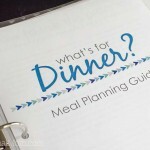 Right now I’m giving away a FREE 11 page printable meal planning guide as a gift for new email subscribers – perfect for adding to your own command center! 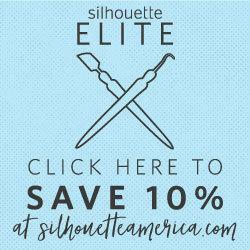 Sign up by clicking HERE and have the freebie delivered straight to your inbox! Do you already have a command center somewhere in your home? Or are you planning on making one anytime soon? I’d love to hear about it! Great job! Very stylish and functional! This inspires me to finally tackle such a project. I’ve always wanted to do this but we are short on wall space, but after seeing your layout, I think I can make something work, just a more compact version. Thanks for sharing! This looks great! I love all of your storage ideas! I love how command centers look. They appeal to my organizing nature but I don’t have one. Instead I keep everything in different areas and it works well. Great command central! I am soon-to-be-divorced and have no kids and will eventually have my own apt. Is it weird/dumb to have a command center for 1 person? I am always losing papers, esp. bills! Definitely NOT weird or dumb to have a command center for 1 person! Sometimes I feel like I need to create one for each member of the family :-) I don’t think HomeGoods sells online since their inventory really varies store to store…but you could probably find something similar at a place like Target, or TJ Maxx, or maybe the Container Store online? 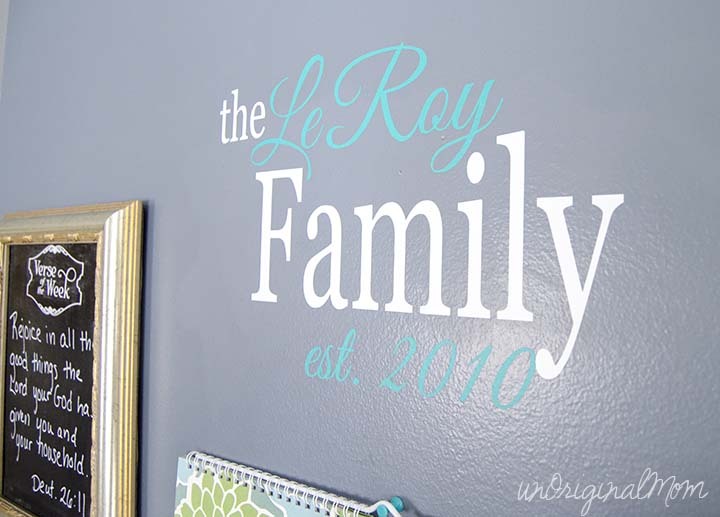 Where do you recommend getting the vinyl lettering from? Hi Lauren, I made it myself with my Silhouette, but there are plenty of sellers on Etsy who will do custom vinyl designs for your wall! Love the command center ideas! I signed up for your newsletter and the menu planner, but I never received the menu planner. I checked my spam as well. Any way you could send it again? Thanks! Hi Vicki, I don’t have your name or email address on my list, so it looks like your subscription didn’t go through for some reason. Did you receive a confirmation email to confirm your subscription? Maybe try subscribing again and if it still doesn’t go through send me an email (meredith@unoriginalmom.com) and I’ll send you the planner. Sorry for the trouble! I love you calendar! Could you tell me where I can find one? 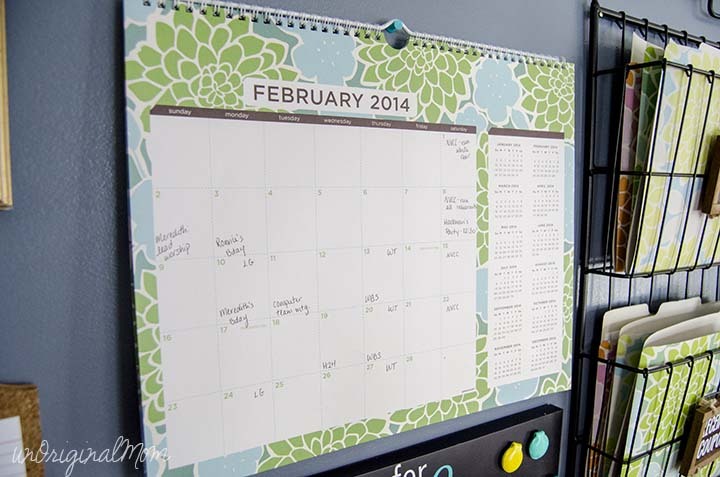 Hi Jana, I got this calendar at Target a few years ago, I don’t know if they still carry the same one, but you could check! 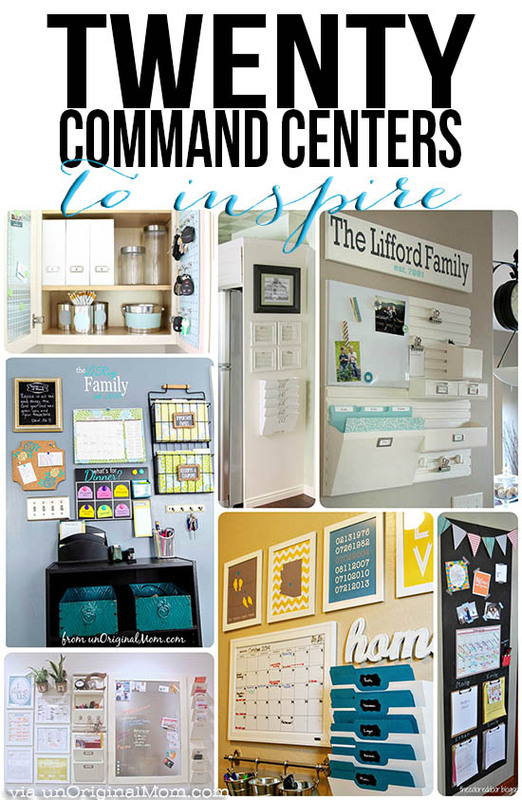 What an amazing way to go about making a command center for your family! The best tip in here is to figure out your needs first! I’ve seen so many command centers stay unused because people don’t do this crucial step! 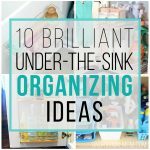 I’ve gained a lot of great ideas from this post and can’t wait to put them into action!